Invite up to 50 guests for business meetings, training seminars or social gatherings inside the 744-square-foot event space at the Country Inn & Suites, Austin-University, TX. Our meeting room offers flexible seating arrangements and amenities like free high-speed Internet access, audiovisual equipment rental and coffee service. Let our friendly staff help you iron out the details of your event so you can focus on your guest list. Choose menu items from several restaurants within walking distance of the hotel, or create your own menu. 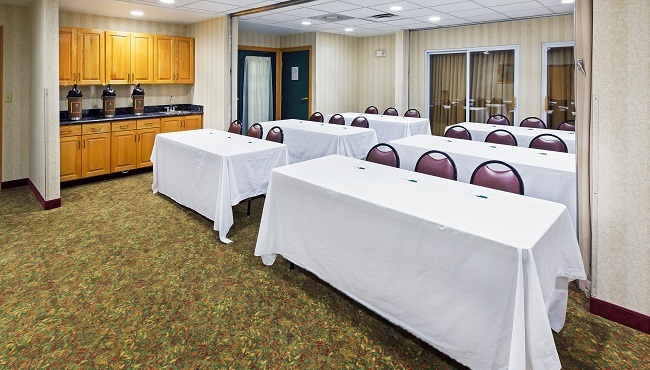 Groups reserving 10 guest rooms or more are provided the meeting room at no additional cost. View the meeting room layout. Daily, 7:00 a.m. - 11:00 p.m.